Este hermoso y moderno apartamento con área de patio privado ofrece una sala de estar / comedor de planta abierta y una cocina completa (¡si desea cocinar!) con todos los electrodomésticos que pueda necesitar, incluido un lavaplatos. La amplia sala de estar iluminada por el sol tiene TV de pantalla plana con canales del Reino Unido y un sofá cama de tres plazas, para huéspedes adicionales. El dormitorio ofrece una cama doble con mucho espacio en el armario y cortinas pesadas para ayudarlo a dormir bien. El baño tiene una cabina de ducha moderna y también encontrará una lavadora, plancha y tabla de planchar para su comodidad. Se proporcionan toallas y secador de pelo, incluidas toallas de piscina. Wifi está disponible de forma gratuita. Este complejo seguro está bien mantenido con un área de recepción, piscina climatizada y supermercado directamente sobre la carretera. El complejo también tiene una piscina para niños y zona de juegos. Podemos proporcionar cunas, tronas y otros artículos esenciales para la familia para nuestros huéspedes más jóvenes. El apartamento está idealmente ubicado a solo cinco minutos a pie del casco antiguo o de la franja más nueva con playa Grande y de una gran cantidad de tiendas, bares, cafeterías y restaurantes. Encontrará una lavadora, plancha y tabla de planchar escondidas en el baño por si acaso las necesita. Very clean apartment with everything you need. WiFi, iron, hair dryer, washing machine. Very central for the beach and bars and restaurants. We were met from the taxi by Caroline who was very friendly and helpful. Would definitely recommend this apartment and we will return. Thank you very much for your kind words, I hope we meet again soon! Thanks very much for the recommendation guys, hope to see you again soon. The apartment was superb, spotlessly clean very spacious and everything you needed from beach towels to kitchen towels. The pool area was great so clean and plenty of sun loungers. The location was fantastic you could walk into the strip or walk to the old town. There is plenty of shops a 2 minute walk from the apartment , spar and Lidl . We had great customer service from the manager who couldn’t of been more helpful to us. 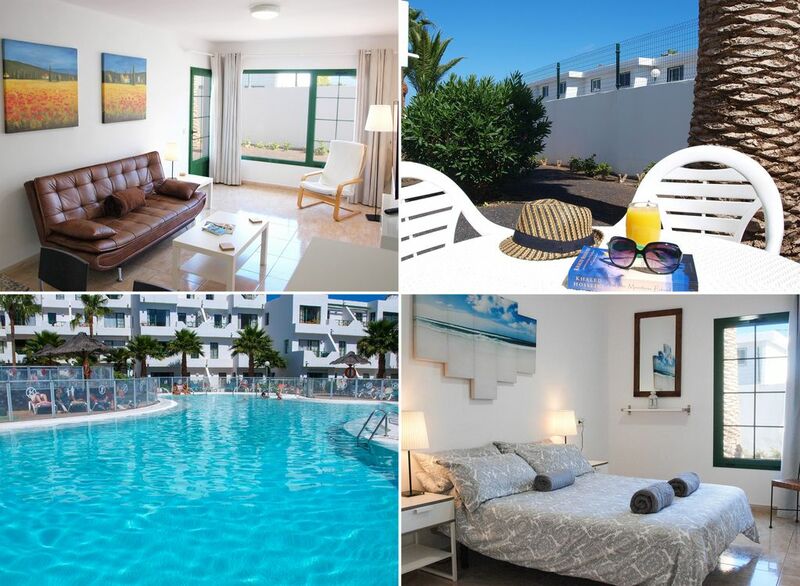 I loved it so much we have booked it for 2019.I would recommend this apartment and location to anyone looking for a fabulous holiday. Plenty restaurants and great live music at many of the pubs. Great apartment, spotless and everything you could need was there. Caroline very helpful and easy to contact before and during our stay. Would book again. Thank you Jean, we look forward to seeing you again in the future. Property was well above expectation. Had a really great week , flat was spotless and handy for for pubs, restaurants and shops. Would have no hesitation recommending this place. Looking forward to returning there. Very clean and spacious and great location ,also good bus service just outside the apartments . Nice pool and great being able to get a lounger anytime ! Thank you for your kind words, we look forward to seeing you again in the future.